Continuing to solve the problem discussed at the end of Part II…..
Now, according to Hess’s Law all we need to do is to add all the enthalpies associated with each step of the Born-Haber Cycle to calculate the lattice energy. Connect to WiFi to avoid cellular charges for video streaming. Be sure to watch video’s Lattice Energy Part I and Part II before reviewing the transcription. Part II begins with a continuation of the discussion on EA: Electron Affinity. Since heat is released, the reaction is exothermic and the Δ H is a negative number. That means that the chloride anion, Cl- (g) is more stable than the chlorine free radical, Cl (g). A free radical is an atom with at least one lone electron in its outer shell. Remember that Cl normally exists as a diatomic molecule, Cl2 gas. We discussed the energy required to break the Cl—Cl bond in the discussion of dissociation energy. The next term you will need to understand to calculate lattice energy using the Born-Haber Cycle is Lattice Energy itself. 5. Lattice Energy is the enthalpy change (Δ H) that accompanies the formation of 1 mole of an ionic solid from its separated gaseous ions. In your text book if lattice energy is defined as the amount of energy required to heat a solid to the gaseous ions, the lattice energy will be a positive number. If it is defined as the energy released when the gaseous ions combine to form the solid lattice, then the lattice energy will be a negative number. The absolute value is the same. The sign reflects the direction of the reaction depending on whether energy (heat) was added or removed. The final term you will need to know to calculate lattice energy using the Born-Haber Cycle is the standard enthalpy of formation. The superscript ‘’o’’ indicates a ‘’standard’’ given temperature and 1 atomosphere pressure. The subscript ‘’f’’ indicates that this is the formation of 1 mole of a substance from the reference form of an element in its standard state. So how do we use the Born-Haber Cycle to calculate the lattice energy of an ionic compound? Let’s work a typical problem you might see in a textbook. In this video I will discuss lattice energy and how to use the Born-Haber cycle to calculate lattice energy from known enthalpies of certain reactions. What is lattice energy? Lattice energy is the energy released when ions in the gaseous form are combined to form a solid ionic compound. 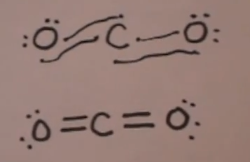 In this symbolic expression, gaseous sodium ion and gaseous chloride ions combine to form a more stable solid sodium chloride. Whenever a reaction goes to a more stable compound, heat is released. The magnitude of the energy released is the lattice engergy expressed as a ΔH of NEGATIVE 787 kJ/mol. Since energy was lost, the ΔH is a negative number. This change in thermal energy, or change in enthalpy associated with the reaction is represented by the symbol ΔH. If the reaction were to be reversed, it would require adding heat to break the solid up into gaseous ions. That reaction would require a ΔH of POSITIVE 787 kJ/mol. So to summarize, if heat is lost, the change in enthalpy or ΔH is negative. Since heat is given off, it is an exothermic reaction. 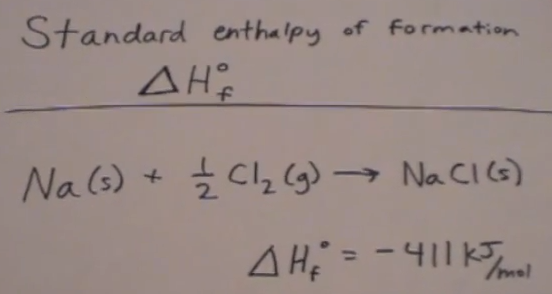 If heat is added, the change in enthalpy or ΔH is positive. When heat is used by the reaction, the reaction is an endothermic reaction. Lattice energy is released when gaseous ions come together to bond as a solid. It is an exothermic reaction. 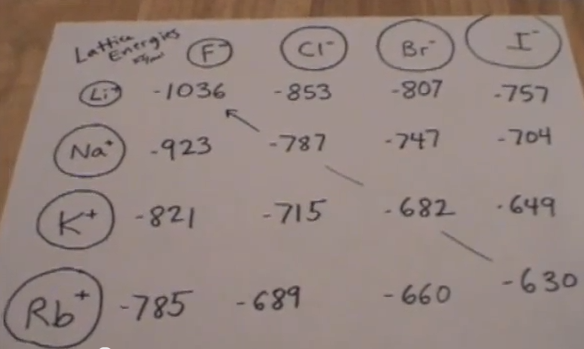 The change in enthalpy or ΔH is negative. The solid form must be heated in order to convert the solid back to the ionic gaseous form. Since heat is added, it is an endothermic reaction and the change in enthalpy or ΔH is positive. How does the size of the anions and cations affect the magnitude of lattice energy? Smaller atoms are closer together and are held more strongly than larger atoms. 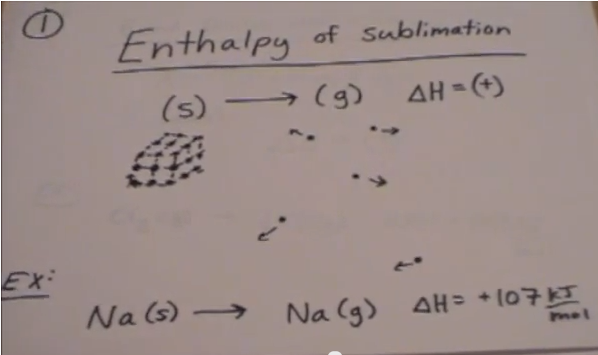 Therefore the magnitude of the change in enthalpy is higher for the smaller molecules. How does the size of the cation and anion affect the magnitude of the lattice energy? The smaller the atoms, the stronger the attraction (ionic bond) between them. So looking at the table, the absolute value of lattice energy is predictably larger for LiF (-1036) than for NaCl (-787) or at the bottom RbI (-630). The value of the lattice energy is negative or positive depending upon whether the ions are coming together as a solid compound and therefore negative or whether they are split into the gaseous ions in which case the value would be positive. The absolute value of the numeric magnitude is the same. Again, energy is required (positive lattice energy) to break a bond. Energy is released (negative lattice energy) when a bond is formed. Repeating the definition: Lattice Energy is the energy released when gaseous ions combine to form a solid ionic compound. We have discussed the inverse relationship between the size of the ions and the magnitude of lattice energy released when the ions form a bond. 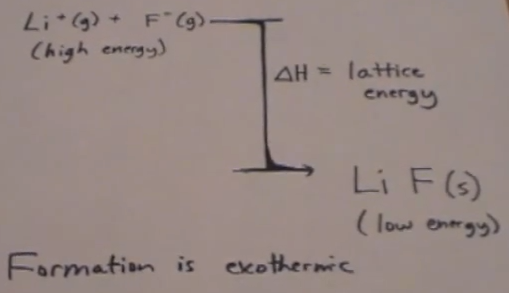 The charge also affects the lattice energy. The higher the absolute value of the charge of the ion, the stronger the ionic bond. 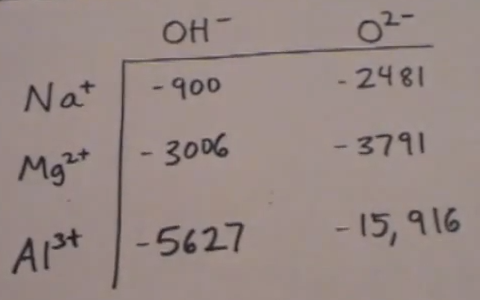 For example, the absolute value of the lattice energy released by the reaction of Al3+ + 3OH– ( | -5627|= 5627) is higher than when Na+ + OH– ( | -900|= 900) are combined. 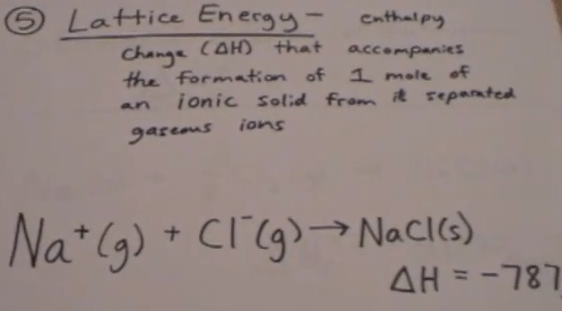 This is because the higher charge of the Al3+ cation when compared to the Na+ cation. The same is true for the charge of the anion. Look at the chart and compare the lattice energy of Na+ + OH– ( | -900|= 900) with Na+ + O2- ( | -2481|= 2481). The absolute value of the lattice energy released is larger associated with Na+ +O2- than with Na+ + OH– due the more negative charge of the O2– anion. To restate this concept in other terms, the higher the absolute value of the valence of the ion ( |valence| ), the higher the lattice energy of the ionic compound. This means the compound is much more stable. It will take more energy to break the bond. The formation of the solid ionic compound from the gas is exothermic and more heat will be given off when compared to formation of compounds with ions of lower valence. Look at the chart and note the lattice energy when Al3+ + O2– are combined. This is a very exothermic reaction and the absolute value of lattice energy released is |-15916|. Since energy is released from the system it is expressed as a negative number. If heat were applied to the solid compound, 15916 kJ/mol would have to be added to break the ions back into their gaseous state. When energy is added, the reaction is endothermic and the lattice energy is expressed as a positive number. The absolute value (magnitude of energy change) is the same. This diagram illustrates the change in lattice energy when gaseous form of the lithium cation and fluorine anion are combined to form lithium fluoride. The gaseous ions are at a higher energy state than the lithium fluoride solid compound. This difference in energy state results in heat being released with the formation of the solid compound. Since energy is release, it is an exothermic reaction. The magnitude of this change is the lattice energy. Sometimes its not so easy to directly calculate the lattice energy taking the gaseous ions that form that solid, so what we do is indirectly calculate the lattice energy using the Born-Haber cycle. To use the Born-Haber Cycle, you have to understand a few terms. Values of the enthalpy of sublimation for known substances may be found in tables where the values have been calculated by physical chemists. For this lesson you need to know that these are calculated values, but we will look them up in a table. We will leave the “how to calculate” the values up to the physical chemists. 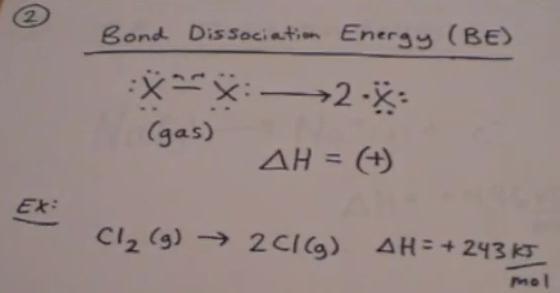 Bond dissociation energy is the energy required to dissociate or break a bond between atoms. In the illustration above, using any of the halogens designated by the symbol X, there is a homolytic cleavage of the bond between X—X (gas) to release 2 atomic radicals of the halogen atom. The bond dissociation energy to break a molecule of chlorine gas into 2 atoms of chlorine radicals can be expressed by the equation given in the example at the bottom of the diagram. ΔH = +243 kJ/mol The positive number indicates that energy is required before diatomic chlorine gas will dissociate into free radicals. The 3rd term you will need to understand in order to use the Born-Haber Cycle to calculate lattice energy is the Ionization Energy, IE. ΔH = +496 kJ/mol This is the amount of heat which would be required for this step. The smaller the atom, the lower the amount of energy required to release an electron. More energy is required by atoms to the right of Na in the periodic table. More energy is also required for atoms below Na in the periodic table. Since Na is in group 1 and period 3, it is a relatively small atom and will have a lower ionization energy than elements in the other groups in period 3. It will also have a lower ionization energy than elements in periods below period 3. Na is an alkali metal, a member of group I in the periodic table, and has only one electron in its outer shell which can be removed. What would we have to consider instead of Na, we chose Mg, an alkaline earth metal, a member of group II in the periodic table? Members of the alkaline earth metals have 2 electrons in their outer shell which can be removed. For these elements there are 2 ionization energies. The ionization energy for the first electron, and the ionization energy to release the second electron. It will require more energy to remove the second electron than the first so the second ionization energy will be higher than the first ionization energy. So the first ionization energy is the amount of energy required to remove one electron from the outermost shell of an atom in its gaseous state. The last consideration of terms you need to know before you can calculate lattice energy using the Born-Haber Cycle is Electron Affinity, EA. Electron affinity is the energy released when an electron is added to a neutral atom in its gaseous state to form an ion. In the case of chlorine gas radicals (produced by dissociating the bonds of diatomic chlorine gas discussed above), adding an electron releases 349 kJ/mol. The fact that energy is release means that chlorine ion gas is more stable than the chlorine gas radical and the change in enthalpy is a negative number. If you plan to view the video on your cell phone, consider your data plan and whether you should wait until you have a WiFi connection to avoid cellular charges. Connect to Wi-Fi to prevent cellular data charges for video streaming. 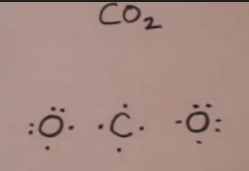 How do we use Lewis dot structures to illustrate bonding in CO2? We we know that the oxygen atoms will repel each other so carbon will be in the center with an oxygen at each end. How many valence electrons do each of those atoms have? Well we know oxygen has six valence electrons because it is in periodic table group 6A. Carbon is in group 4A of the periodic table so it has 4 valence electrons. This Lewis dot structure demonstrates that oxygen has 2 unpaired electrons and has 2 unpaired electrons available for covalent bonds. Carbon has 4 unpaired electrons available for 4 covalent bonds. The illustration shows how to use a Lewis dot structure to represent the bonding in the CO2 molecule. The chemical symbol for methanol is CH30H or CH40. Hydrogen can only form one bond so it can not be the central atom. Hydrogen is always on the outside of a molecule with which it is sharing electrons. We know therefore that Carbon and Oxygen will be in the center with 3 hydrogen atoms surrounding the carbon atom and a single hydrogen bonding the oxygen atom. Here we demonstrate the valence electrons with dots. Carbon has 4, hydrogen 1 and oxygen 6. It is easy to see that when the electrons are shared each atom will have its outer shell completed. With sharing each hydrogen will have 2 electrons, carbon 8 electrons and oxygen 8 electrons in the outer shell. The molecule is balanced and happy . When the dots are connected between the shared electrons, the Lewis dot structure is completed. This is the Lewis dot structure for methanol. The first step is to identify the central atom, in this case nitrogen, and write the symbol for nitrogen, N. The 3 oxygen atoms, symbol O, are distributed around the central atom, N. Now look at the periodic table to determine the number of valence electrons. 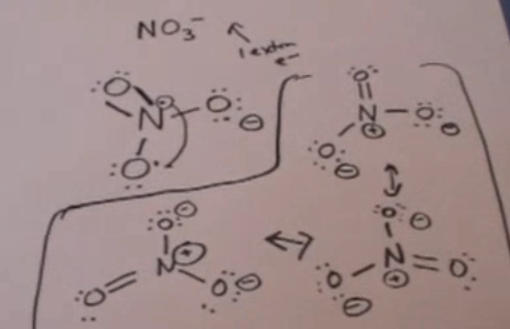 Nitrogen is in Group VA and has 5 valence electrons. Oxygen is in Group 6 and has 6 valence electrons. Oxygen is more electronegative since it has more valence electrons and is to the right of nitrogen in the periodic table. In this illustration the valence electrons are distributed around each of the atoms. The octet rule predicts that the electrons will want to form 4 pairs around each atom. Notice that oxygen has 2 electrons available to form a pair and nitrogen has 3 lone electrons. Since this is an anion and has a negative charge, an extra electron must be added to one of the more electronegative oxygen atoms. This extra electron is indicated at the arrow in the drawing above. The minus sign indicates that this electron accounts for the negative charge of the anion. This electron was donated by the associated cation which has a positive charge. Our working diagram is on the left. In order to satisfy the octet rule on each atom, nitrogen formed a double bond with one of the oxygens, it donated an electron to another oxygen and the 3rd oxygen gained an electron from its associated cation. The octet rule is fulfilled for each atom and the overall net charge on the molecule is negative 1. 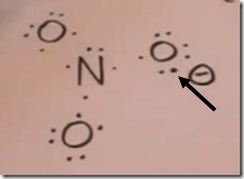 There are 3 possible Lewis structures for the nitrate anion. These are referred to as resonant structures and reflect the dynamic relationship of the electron sharing in the overall molecule. 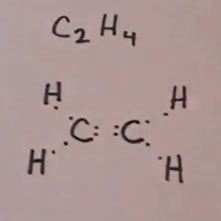 C2H4 is the symbol for the simple organic compound, ethylene. 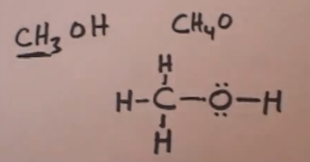 It is the simplest alkene (hydrocarbon with carbon-carbon double bonds). This illustration demonstrates how to draw the Lewis dot structure for C2H4. The first step is to write the symbols for carbon (C) adjacent to each other in the center and the hydrogens (H) will have to surround the carbons. The hydrogen atoms will be distributed evenly on the outside of the molecule so we draw 2 symbols for H outside each carbon. The next step is to draw the valence electrons. Hydrogen has 1 carbon has 4. In this diagram, the dots were connected to show that the valence electrons are being shared in covalent bonds. Each of the lines represent 2 electrons being shared. Remember that hydrogen needs 2 valence electrons (a duet) to complete it’s outer shell. Carbon needs 8 valence electrons (an octet) to complete its outer shell. As we look over this diagram, we can see that by sharing in covalent bonds, every atom has a full outer shell of valence electrons (2 around each hydrogen and 8 around each carbon). 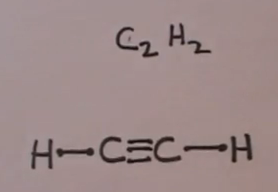 C2H2 is the symbol for the simple organic compound, acetylene. It is the simplest alkyne (hydrocarbon with carbon-carbon triple bonds). This illustration demonstrates how to draw the Lewis dot structure for C2H2. To begin, a C for each central carbon was drawn in the center. 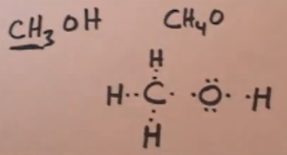 The hydrogens must go on the outside and they must be as far apart from each other as possible, so we draw one on each side of the molecule in line with the carbon atoms. Next we put in a dot for each electron and connect the dots. CH2O is the symbol for the simple organic compound, formaldehyde. It is the simplest aldehyde (hydrocarbon with a carbon atom connected to an oxygen atom by a double bond and to a hydrogen atom by a single bond). This illustration demonstrates how to draw the Lewis dot structure for CH2O. 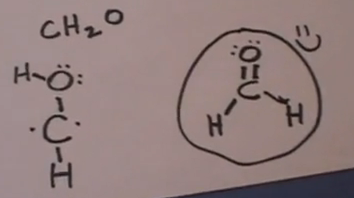 On the left the attempt to draw the Lewis structure failed when we attempted to join one of the hydrogens to oxygen. However, on the right, we know it is the correct Lewis structure because all atoms have their complete set of valence electrons. There are 8 surrounding oxygen and carbon (a complete octet) and hydrogen has its full set of 2 (duet). Next to draw the Lewis dot structure for ethanol, the alcohol which is found in fermented beverages. Fermentation is the organic chemical reaction whereby yeast metabolize sugars which are found in fruits to ethanol and carbon dioxide. The molecular formula for ethanol is C2H6O. There would be 2 ways of writing the Lewis structural formula C2H6O. When compounds have the same molecular formula but different structural formulas they are referred to as isomers. We want to draw the Lewis dot structure for ethanol. Another way of writing the molecular formula for ethanol helps to illustrate exactly which isomer we are referring to and how we should draw the Lewis dot structure. Writing the formula as CH3CH2OH indicates we are specific that we are referring to the isomer of C2H6O which is ethanol. By writing the formula in this way we know that there is a CH3 group, a CH2 group and an OH group. Writing the formula in this way (CH3–CH2 –OH) tells us which of the structural formulas we are referring to and how to draw the Lewis dot structure. When we draw the Lewis dot structure, we first write the central atoms. Remember hydrogens always go on the outside. We start with the CH3 group, then CH2, then OH. Next step is to place dots for the valence electrons. Hydrogen gets 1, carbon gets 4 and oxygen gets 6. The lone electron is available for bonding. The Lewis structure is complete when we connect the dots to show the sharing of electron pairs between different atoms. Here is the Lewis dot structure for the other isomer of C2H6O, dimethyl ether. Another way of writing this molecular formula is CH3-O-CH3. Here is the Lewis dot structure for dimethyl ether. Although it has the same molecular formula as ethanol, it is a different compound with different physical properties because of the different way the atoms are arranged. Dimethyl ether is a gas, not a liquid. Dimethyl ether is used as a refrigerant and is used to freeze warts much the same way as liquid nitrogen. It is not something anyone would want to attempt to drink. It is an isomer of C2H6O which is the same molecular formula as ethanol.